Who would have imagined that traditional Yemenite songs could hit pop charts worldwide? 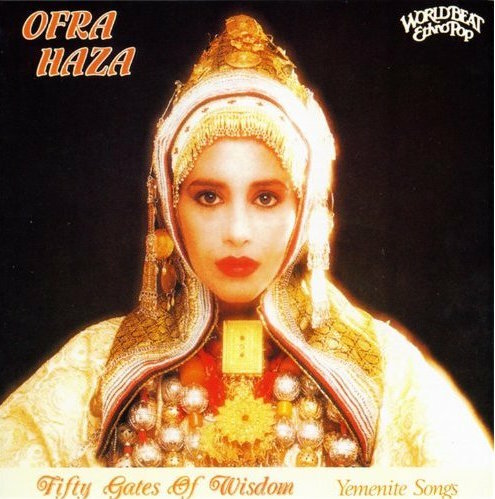 Ofra Haza, a popular Israeli singing star, decided to record an album of songs sung traditionally by her Yemenite Jewish forbears - songs derived from devotional poems performed at festive occasions such as weddings. But these ancient songs were recorded - traditional rhythms and melodies intact - with contemporary pop production. Amidst the array of Western instruments are tin-can percussion used by Yemenites traditionally. Topping it all is Ofra Haza's exquisite soaring voice - a beguiling instrument in itself (so beguiling that two of the biggest dance hits of 1987 - "Pump Up The Volume" and "Paid In Full" - sampled her voice into their mix!). The results are stirring and haunting at the same time; relentlessly danceable yet light-years away from the four-beats-to-the-bar straight-jacket of most contemporary dance records. The arrangements, using a full string section, acoustic bass, flute, oboe, English horn, bassoon, French horn and clarinet amidst multitudinous percussion, are subtle but compelling. This diverse palette of instruments is used discretely to subtly alter the high-tech textures.